Buy CISS Brother DCPвЂ“350C and make 30 times more quality prints for the same money! Pay only 0.04 USD for A-4 full color print! Ink System for Brother dcp-350c: What for do you need it? The main purpose of Continuous Ink Supply System ciss brother dcp-350c is to provide uninterrupted supply of ink to the printing head in proportion to their consumption. In contrast with cartridges, where the ink level is limited with its capacity (15 ml on the average), in ciss dcp-350c outer ink containers are provided, which have a greater capacity. 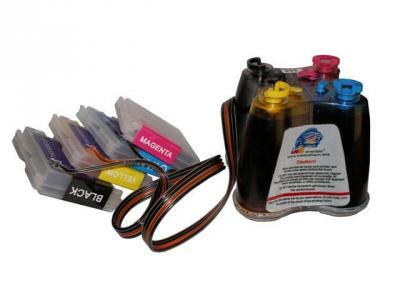 This function allows to increase the printing capability, and moreover makes it possible to apply alternative ink, the larger volume of which is on the market, and which has lower price than the original one. During the ciss ink system brother dcp-350c installation, as well as installation of similar models ciss for brother dcp-385c and ciss for brother mfc-6490cw, any mechanical changes or damages of printer will occur. This operation can be associated with replacement of cartridges. The only difference is that it is necessary to fix the silicone lap at the printer's case via some fittings or adhesive strip. Moreover, the installation of such equipment will extend the life of the printing head. The ink reservoirs have handy filling openings for ink refilling. They are connected with special cartridges, which are installed on proper locations (as well as original cartridges) via silicone lap. 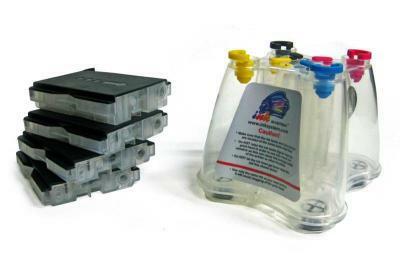 During printing process the ink in cartridges is consuming and decreased pressure appears, due to this ink overflows from the outer containers through elastic lap. In such a way the ink runs to the printing head continuously. You just have to add ink to the outer containers ever and again. And you could do it even during printing process. What advantages you will get with the usage of CISS for dcp-350c in your inkjet printer? The capacity of donor tanks is 10-20 times larger, than the original cartridges have, that allows you to print more than 3000 photos of 10x15 formats without refilling. The prime cost of 10x15 format prints, which are made at home, is 20-50 times lower, than the cost of prints, made in photo labs. When refilling, you don't need to remove cartridge out of the printer that is why air doesn't penetrate the printing head, as a result the operating life becomes longer. And as you know, it is the most expansive detail of printing device. The price of one ciss for brother dcp-350c system with ink is lower, than the price of one set of original cartridges. The possibility to add ink of different color in accordance with their real consumption.